If real ducks glowed in the dark, night duck-hunting would be the national pastime. 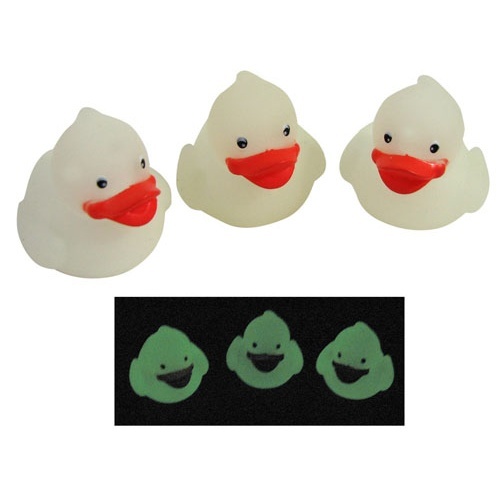 For now, we'll have to settle for these miniature rubber duckies, about 1-5/16" from their bright orange beaks to their little duckie tails, and 1-3/8" tall. 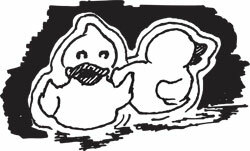 You'll get a dozen frosty white GITD duckies. Our media maven Bill suggests a nice bubble bath in the dark. "Please send pics," he says. Enough to decorate a big ceiling, or make a really special nightgown. 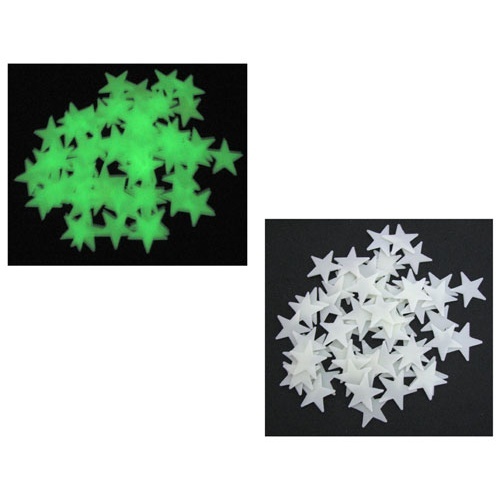 These (60) flat, plastic stars measure 3/4" across and glow in the dark, not unlike the real thing. Includes a pack of tiny double-sided adhesive mounts. How Big Is Your Ceiling? 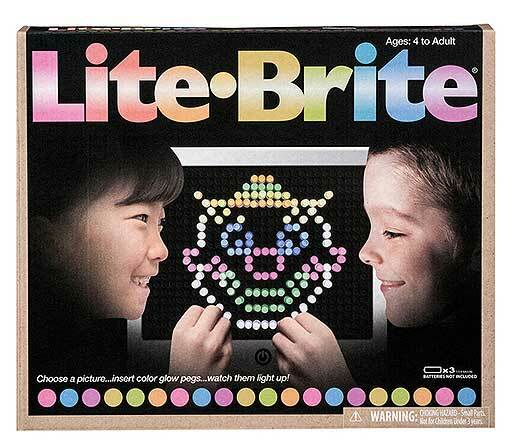 Gen Xers will remember hours of fun spent with the original Like-Brite before the Millennials ruined everything. Well, it’s back and like the cereals you used to eat, it’s New and Improved, with LEDs behind the 8-3/4” x 1-1/2” case housing a 33- x 21-pin matrix with (156) translucent neon pegs. Includes a detachable storage tray, so you won’t lose the pegs in the family room’s shag carpeting, plus an art guide and (2) templates. You add (3) “AA” batteries and a dimly lit room. Still from Hasbro, still a lot of fun, and for ages 4+. It’s called Thinking Putty® because while you do whatever you want with it, your brain relaxes and opens up to all kinds of creative thinking. Need it? Yes. And you can also knead it. 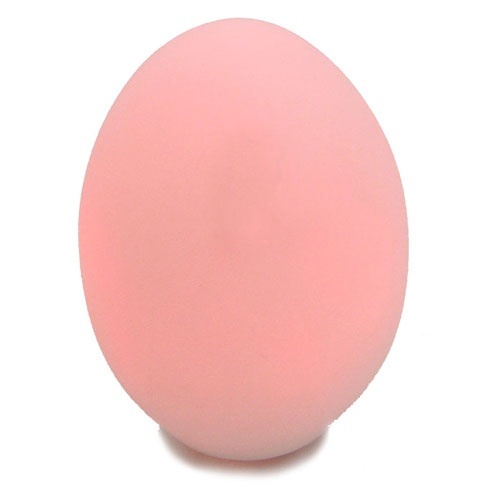 Or bounce it, bend it, tear it, stretch it, snap it, pop it. 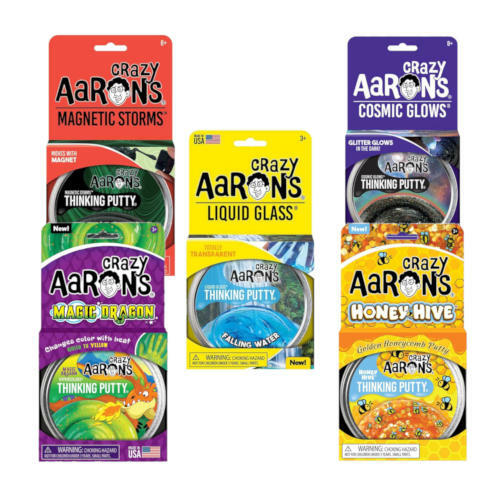 Pick from the 3.2 oz of dark green magnetic Strange Attractor putty with iron filings infused in it, plus a 1/2” cubed rare earth magnet; the 3.2 oz glimmering light green Foxfire putty that you can draw on with the included blacklight keychain light; or the Super Scarab, 3.2 oz. of color-shifting blue/purple/copper/red putty reminesent of Egyptian scarabs. 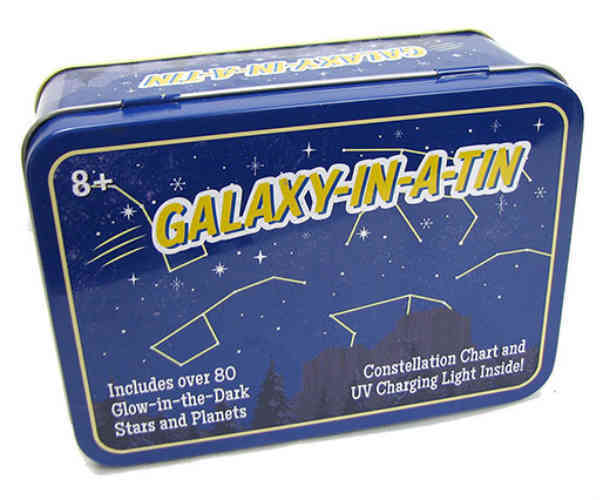 Comes in a 4” dia x 1-3/8” tin. Get all festive in the dark with this 144-piece party pack of (66) glow sticks, 3/16” dia in 1-1/2”, 4”, 6’, 8”, and 10” lengths (40 feet in all) plus connectors, cords, caps and clips. Sticks glow yellow, pink, orange and white. About the size of drinking straws, from super-short to extra-long. Non-toxic, but don’t rip ’em open or they might stain your party frock. Shake and snap to start, and you’ll get an hour or so of glowishious fun. Hanging from your ceiling. 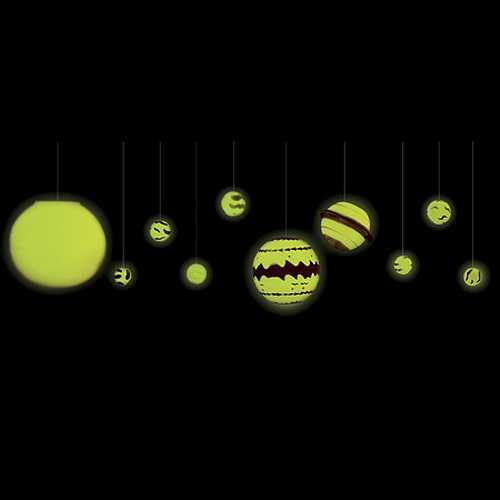 Our multi-color glow-in-the-dark solar system DIY 3-dimensional mobile includes a 4-1/8" dia sun, 2-3/4" Jupiter, 2" Saturn with removable rings, 15/16" Uranus and Neptune, 13/16" Earth and Venus, and 11/16" Mars, Mercury and Pluto, all with little rings at the top to hang them from. Includes (32) feet of cord and a fact sheet. If, on the other hand, you want to be on the astronomical cutting edge, just leave Pluto in the box and tell him to get over it. You can trust the moon--there are no investment advisors there. 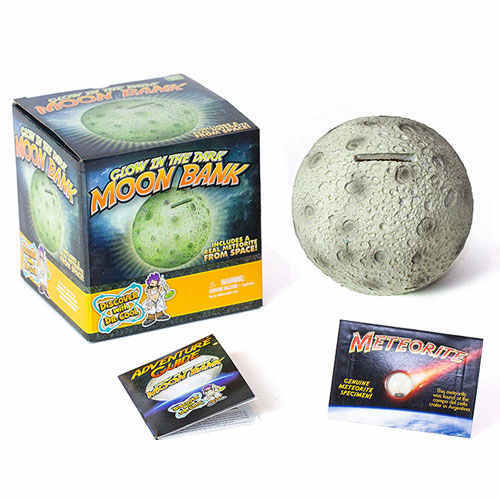 This moon is 4-5/8" dia in polyresin, glows in the dark and has a coin slot, unlike the real one. Includes a lunar fact sheet and, as a bonus, a 3/16” long piece of an actual meteorite from the Campo De Cielo crater in Argentina. Chemiluminescence, which is glow-in-the-dark to anyone who doesn’t like six-syllable words, is a favorite here. Half the warehouse glows in the dark, and that’s not counting the staff. 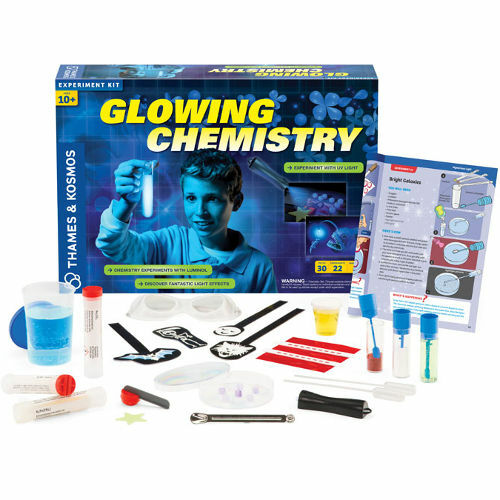 All of which is why we’re selling this 30-piece Glowing Chemistry kit from Thames & Kosmos. Comes with 3g of luminol, 6g of potassium hexacyanoferrate and 12g of sodium carbonate, plus test tubes, pipette, goggles, measuring cups, stir sticks and UV beads among other stuff, including a 48-page manual with (22) different experiments (because 22 of the same experiments would be stupid). For ages 10+. Made in Germany.